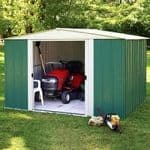 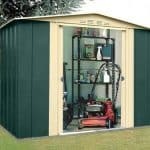 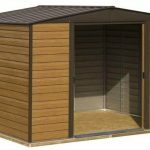 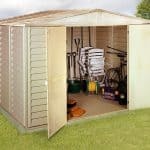 This is a handsome looking premium metal shed which is manufactured from maintenance free steel and clad in wood grain and with large double sliding doors for ease of access. 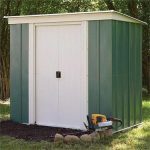 It has additional white trim styling detail making it a good looking garden building. 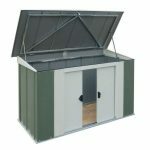 There is plenty of ventilation through front and rear vents so it has air circulating inside – it’s an excellent choice metal storage solution with great interior space for all your light gardening equipment, outdoor toys and small pieces of garden furniture.